The process of selecting the right bearing and maintenance products for your application just became easier with the introduction by Quality Bearings & Components – QBC of their new catalog/handbook B705 on CD-ROM. It features over 7,800 off-the-shelf products in three catalogs. Catalog B700 features over 400 Bega maintenance products including: induction heaters, bearing monitoring tools, mechanical and hydraulic pullers, and pulley and shaft alignment equipment. QBC has become the official authorized stocking distributer for Bega’s wide range of high-quality tools for bearing maintenance in the USA. One highlight of the CD is a comprehensive technical section found in the 394-page B620 catalog, which covers bearing design and selection. It features rolling contact bearings, sintered-metal bearings, plastic and nonmetallic bearings, reviewing such basics as bearing selection factors, load factors, tolerances, sizing, and bearing mounting. The catalog references the QBC Web site and our eStore, which allows you to check price and availability, place an order, or request a quote anytime. 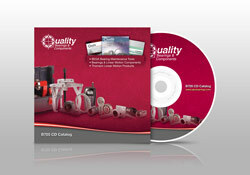 QBC also provides custom-made bearings and shafting to the customer print. QBC can supply on-site rebuilding of bearings in a certified class 1000 clean room. Major product groups on the CD-ROM include: ball bearings, thrust bearings, sleeve bearings, needle bearings, roller clutches, guide wheels & rail systems, linear ball bearings, lined aluminum linear bearings, and inner- and outer-ring spacers. The CD also features over 350 products in catalog B612, including ball bushings, pillow blocks, and shafting from Thomson Industries, for which QBC is an authorized distributor. 2101 Jericho Turnpike, New Hyde Park, NY 11040-5416. Phone: 1-888-276-4787 • Fax: 1-516-616-0443. See it now on the Web at www.qbcbearings.com or call 1-888-276-4787 to speak with someone who can answer any technical questions you may have.